Entry to Bridie Bowl will be £10, which includes your lunch of a Forfar Bridie and a canned drink of your choice. A £5 deposit will be required before the date to cover the cost of ordering bridies, and the remaining fee will be collected on the day. Please send deposits, or if you wish to pay the full amount, to PayPal on craigoffilth@hotmail.com along with your full name. Could this please be sent as a Gift to avoid PayPal fees. If you wish to join NAF on the day, registration will be £5. Any queries can be sent to our club's Facebook page or emailed to the above address. 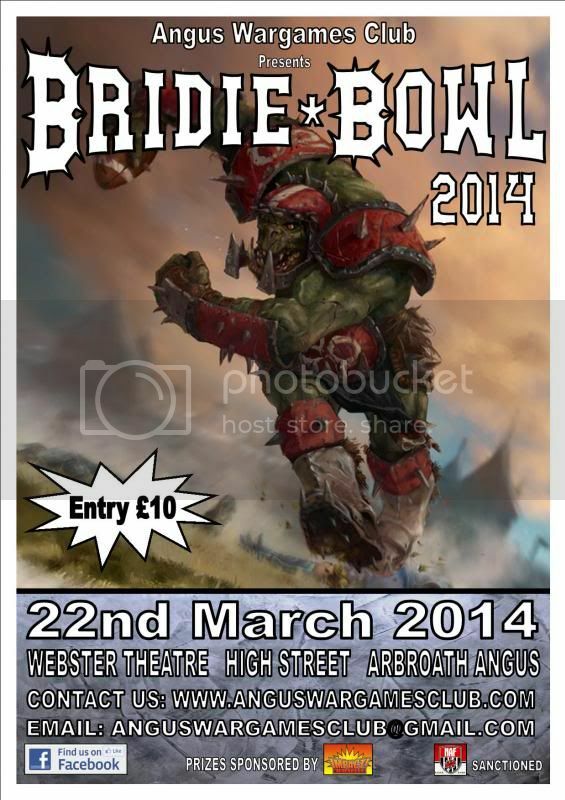 Bridie Bowl will be held at the Webster Memorial Theatre in Arbroath. Arbroath is located on the east coast of Angus approximately 15 miles north east of Dundee, on the A92. There is ample parking locally, all of which is free. For anyone not driving up, the town is on the mainline rail network between Glasgow/Edinburgh and Aberdeen, and the railway station is only a short walk away from the venue. If you feel compelled, you can also get there by boat, but that will depend heavily on the tides. Directions to The Webster Theatre can be found here. Your painted Blood Bowl team. Two copies of your team roster. Dice (blocking dice, D6’s, D8). Your remaining entry fee (if applicable). All official teams allowed, including Slann, Chaos Pact and Creepers. 1,100,000 GP for Team Creation. Inducements and Star Players are allowed. Halfling Chef 100K (Halflings Only). 4 normal skills and 2 double skills can be given to players on your team; all before the first match. No player can be allocated more than one skill and no more than 2 copies of any skill can be taken. Double skills can be exchanged for normal skills if you wish. There will be 3 games on the day. The first match will be drawn at random. Thereafter, each match will be according to the Swiss system. This means that you will play a coach with a similar tournament ranking. After all 3 games, the coach with the most points will become the Bridie Bowl Champion. Tie breakers will be settled by Touchdowns For, followed by Casualties (Blocking only).